I love when authors add to a classic story to try to explain why certain characters act the way they do, especially when it’s a villain. We always just assume that these bad guys are angry, crazy, evil people who enjoy hurting others for no good reason. And sure, sometimes that’s true, but often new authors put a spin on the story that makes you feel rather bad for these rather misunderstood characters. 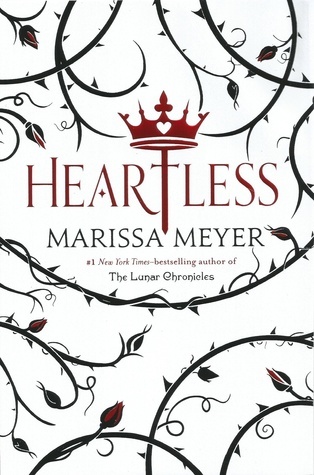 Heartless tackles the story of the Queen of Hearts, a character who I’ve never liked in any version, original cannon or otherwise, and somehow makes her into a very sympathetic character. Synopsis: Catherine Pinkerton is the daughter of a marquess, but she’s also a talented baker who wants to open her own shop. Her parents can’t understand why she isn’t thrilled when the king expresses interest in her, and are concerned that her attention seems to be more focused on the mysterious new court jester. This book came in the November Owlcrate box and I was super excited to get the special limited edition cover. In fact, everything that came in that box was pretty amazing. The smell of the tea makes me super happy every time I open the tin. I took the chance to reread the original Alice in Wonderland first, since they sent a copy along. I figured I should immerse myself in Wonderland as much as possible before heading into this book in case there was the assumption that I would be completely aware of all the references from the source material. I feel like you should have some passing knowledge of Wonderland before reading Heartless, just so the more well-known characters and scenes from the source material aren’t a complete mystery. This isn’t a fast-paced adventure story by any means. Meyer takes the time to let you get to know all the characters and the setting before she launches into any real action. Catherine is a remarkably likable character, especially considering who she ends up becoming later in life. She’s strong-willed, smart, driven, and not nearly as vapid as most of the females in her life. I found myself rooting for her to succeed, even when I know that eventually things don’t go the way she planned. She obviously becomes the Queen of Hearts, but I couldn’t help thinking that maybe things would go well for her, even for just a little while. Meyer does a great job of ensuring that she writes with the same convoluted absurdity that made the original Wonderland books so interesting, while still maintaining her own voice and style. Scenes such as one with the Mad Hatter are just as crazy and silly as you expect from the original, but Meyer’s take gives the character much more depth and personality than Lewis’ more simplistic and childish version. Meyer is obviously writing with an older audience in mind. Even though I was quite excited to know that this is a one-off and that I wasn’t going to be dragged into a new giant series, I’m actually really sad that I won’t get to find out what happens next. I’ve become invested in these characters, and even though I know that their stories technically continue with Alice in Wonderland, I would love to read Meyer’s take on that entire story as well. If you are a fan of Lewis Carroll’s original work, I definitely suggest you pick up this unique take on the origins of his most famous villain. Have you read this book? What was your favourite part? Are you hoping for more about Catherine like I am? Leave a comment below!